2 What is a Dual Zone Wine Cooler? 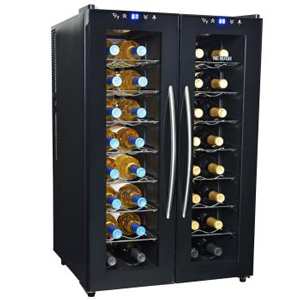 Dual zone wine coolers and refrigerators are a wine enthusiast’s best friend. This is particularly true if your appreciation for wine is not just limited to just one type of wine. A good dual-zone wine cooler essentially gives you the confidence of knowing that all your wines can be stored the way they’re supposed to be stored, in a temperature-controlled environment that preserves their integrity and quality. Use our carefully selected list of the best dual zone wine cooler reviews to help you make the right choice in choosing the best dual zone wine cooler for your specific wine storage needs. 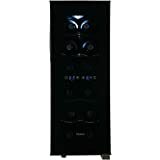 If you have a modest wine collection of about a dozen bottles of your favorite reds and whites, this Haier 12 Bottle Dual Zone wine cooler with a smoked glass, curved door will effortlessly provide the required storage and display space. This unit isn’t popular for nothing. It’s inexpensive and sturdily built, featuring a sleek back finish to its black cabinetry. Two temperature zones are divided into the upper cooling compartment and the lower compartment. These zones are respectively ideal for red and white wine chilling. A digital temperature display (clearly distinguishing between the two cooling zones) allows for accurate monitoring of the internal temperatures, while real wine connoisseurs will appreciate good humidity control that preserves their wines at optimal overall environments. 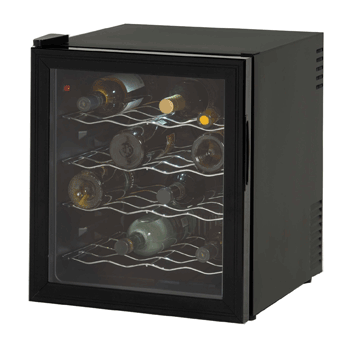 Responding to your temperature adjustments is something this wine cooler does particularly well, making it an essential wine cooler for those enthusiasts who have a modest wine collection. 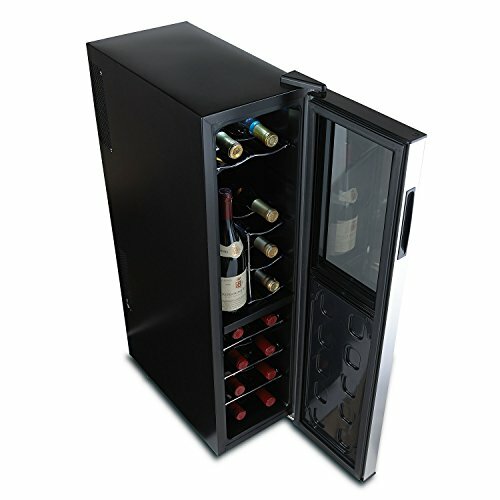 An affordable wine cooler that will keep your small collection well-chilled, but be sure to arrange for solid packaging during shipping. 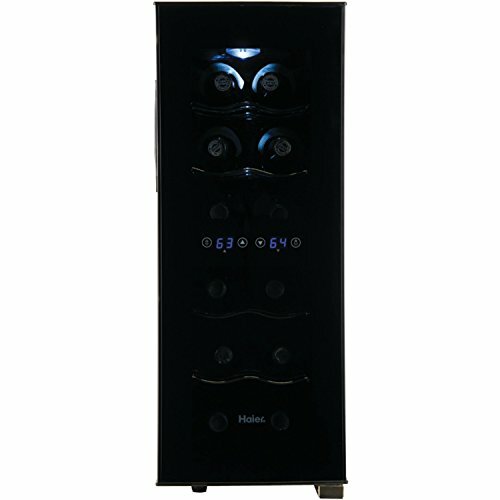 Check out some more Haier Wine Cooler reviews here. Even if you’re a demanding wine enthusiast and you have a delicate collection of wines you regularly consume, it’d be hard for you to find a better wine cooler than this 24-bottle capacity one from Koldfront. This is especially true if you’re particularly looking for a good dual-zone cooler. The mark of a good dual-zone wine cooler resides in how it delivers on the job it was intended to do and this Koldfront does so very efficiently. It also adds oodles of class and elegance to any interior in which it is located. The two temperature zones ranging from 54 to 66F (top) and 46 to 66F (bottom) will keep a total of 24 of your reds and whites chilled to perfection. These temperatures are easily monitored and configured via the LCD adjustment and display panel. Design-wise you can never go wrong with a tempered glass door, finished off with stainless steel trimming. There are a lot of features to like about this wine cooler. Setting it up is very easy, along with setting the temperatures for each of the cooling zones. You definitely get great value for money and some good extensibility to use beyond storing and cooling wine. View more Koldfront wine cooler reviews. One look at this dual zone wine fridge from Wine Enthusiast and you immediately get the sense that it was specifically designed to fit perfectly into small interior spaces. It looks very attractive too with its reflective surface smoked glass door, finished off with a classy stainless steel trim. A total of 18 of your reds and whites are housed in seven chrome shelves (pull-out), with 10 at the top and 8 at the bottom. This CFC-free fridge offers temperatures ranges of 54-66F and 46-66F, maintaining an ambient air temperature of 77F. This is a good wine cooler for narrow interior spaces but needs to be placed properly to accommodate its venting requirements. The quality and taste of your wines are well protected with this cooler and it comes at a great price too. Once you’ve secured some solid shipping and this 18-bottle cooler reaches its ultimate resting place in your interiors, your growing wine collection will be securely stored and beautifully displayed. Thermoelectric cooling technology outputs temperature ranges of 44-64F (upper zone) and 52-64F (lower zone). These are optimized environments for both reds and whites in your collection. An auto-defrost feature makes chilling for decanting a literal breeze and you’ll enjoy a little bit more storage room for standard wine coolers in this price range since common wine coolers of this size and price usually store 16 bottles. As with many coolers in our list of the best wine coolers, good packaging and shipping have a bearing on the durability of its parts, which seem fragile. Packaged and shipped securely, this is a very strong wine cooler that’s perfect for the developing wine collector or discerning connoisseur. You get very good feature-filled capacity for the price you pay. 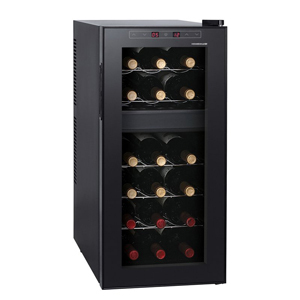 NewAir’s 32-bottle dual zone wine cooler sets the standard by way of the fundamental aim of dual-zone cooling. You get optimal efficiency in cooling different wines with different temperature range requirements. The simple conceptualization of side-by-side compartments each with their own doors adds a world of difference to the manner in which your wines are stored. You get precise, uninterrupted temperature maintenance, with each zone enjoying a huge range of 46 to 66F. We were quite surprised that a relatively large capacity cooler was built with thermoelectric cooling technology as opposed to compression cooling. However, that has good implications for the environment as there are no ozone-threatening CFCs and HCFCs. It should be evident by now that dual zone wine coolers need extra special care when shipped and this NewAir 32-bottle thermoelectric cooler is no different. Once safely installed in an ideal location however, it operates very efficiently and quietly. No wine quality-hindering vibrations. Very nice to look at and it comes at a good price for its capacity and features. What is a Dual Zone Wine Cooler? typically store reds in one compartment, whites and sparkling wines in the other. 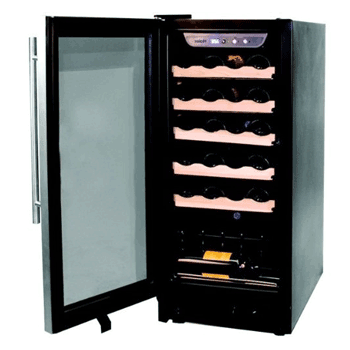 Most dual zone wine coolers have one door which opens up to both compartments. The two cooling compartments are stacked on top of each other and are usually clearly separated by a divider that is distinguishable from the rest of the unit’s shelves. With some manufacturers, however, design variations take the form of a French-door type cooler which perhaps a more convenient side-by-side doors. Each compartment has its own door and is accessed independently of the other. 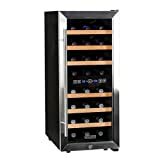 Since red wines require storage in a temperature range of between 58 to 68F, while whites need a lower temperature range of 50 to 62F to maintain their integrity, these are mostly the temperature ranges (give or take) built-into typical dual zone wine coolers from all manufacturers. Understandably (because dual zone wine coolers tend to be larger than single-zone coolers) the majority of dual zone wine coolers are either freestanding or built-in units as opposed to countertop coolers. If you have your heart set on a countertop dual-zone cooler though you’ll inevitably have to settle for a markedly reduced capacity. Dual zone wine coolers naturally tend to cost a little bit more than their single zone counterparts because of their inherent extensibility, but you’ll mostly get good value for your money. Most of this value you get will only be truly appreciated when you open the cooler to pull out a bottle for the occasion. The most obvious and conspicuous benefit of using a dual zone wine cooler is that which dual zone wine coolers were purposefully built to deliver. 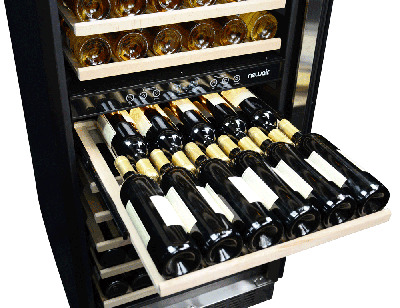 That is the ability to store different types of wines at their optimal temperatures. More specifically, the temperature zone which typically covers the 58-68F range is designed to store some bottles from your red wine collection, while the 50-62F +/- temperature zone is designed to optimally house whites and perhaps some sparkling wines. 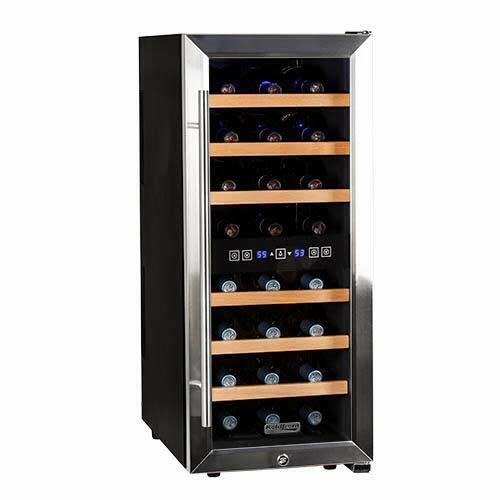 Now, if you’ve ever owned a single temperature zone wine cooler that is geared more towards storing red wines, you’ll naturally be aware of its ability to sneak in some wine wines. However, this depends on the temperature at which you’re chilling your reds. If you’re chilling your red wines (which are to be optimally stored between 58-68F) at no “warmer” than 62F, some of your whites can be stored alongside your reds. This type of single-zone cooler extensibility is no different in dual-zone wine coolers, except what it now means is that if you’re a white wine enthusiast you can use a dual zone cooler (and all its added benefits and features) to store your whites in both compartments. The most important consideration to keep in mind is that wines aren’t meant to be warmer than a certain point and perhaps anything below their optimal temperature storage range is still fine. Dual zone wine coolers go beyond bare basics though, focusing more on storing your wines at their OPTIMAL temperatures to maintain their quality. This is so that those stored wines are constantly ready for decanting and enjoyment. Because of the various wine display and storage needs of wine enthusiasts seeking to purchase a wine cooler, dual zone wine coolers give design-conscious manufacturers a lot more to consider with regards to how the final unit will fare in a range of interior styles. This has given rise to a plethora of design styles sure to accentuate all types of interiors, from classic to contemporary/ultra-modern. Our concerted efforts to carefully scrutinize the performance of various wine coolers accessible to us were carried out with the view of putting together informative dual zone wine cooler reviews for you. We found that the best dual zone wine cooler typically focuses on its primary function of offering two independent temperature zones. This emphasizes optimal storage temperatures for both red and white wines and the ability to easily monitor and tweak those temperatures as the need arises. Pretty much every other feature is just a bonus, but you’ll be well-advised to look for durability in addition to the primary dual-temp zone feature.